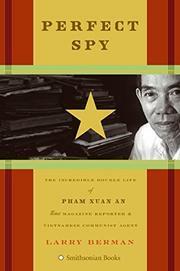 The morally ambiguous life of a respected journalist for Time who turned out to be a spy for the North Vietnamese. Viet Minh soldier Pham Xuan An was inducted into the Communist Party in 1953. The party subsequently funded his journalism education at California’s Orange Coast College, where he became fluent in English and thoroughly versed in all things American. Returning to Vietnam in 1959, working for Reuters and Time for more than 20 years as correspondent, translator and “all purpose go-to guy,” he earned the esteem of brilliant reporters, including Robert Shaplen of the New Yorker, Frank McCullough and Robert Sam Anson from Time and New York Times correspondents Neil Sheehan and David Halberstam. All the while, from this ideal cover, he was funneling valuable information and analysis to Hanoi. After the war, Vietnam made him a People’s Army Hero for his many intelligence coups, which had enabled Hanoi to understand American tactics and battle plans. Berman (Political Science/Univ. of California-Davis; No Peace, No Honor, 2001, etc.) traveled to Saigon to get this story and appears to have had almost complete access to An, his family, friends and files. The author attributes An’s remarkable clandestine success to his perfect impersonation of a reporter: There’s no evidence to suggest he engaged in disinformation or biased the coverage of the newsmen he aided. Though he never knowingly hurt any of his friends, An’s spying doubtlessly resulted in many American deaths. Yet An’s American circle expresses almost no feelings of outrage or betrayal, but rather echoes his own view that he fought not against the Americans, but rather for his own country as a nationalist patriot. A fair-minded, consistently interesting attempt to unpack the “boxes within boxes in An’s life” and a fascinating contribution to our understanding of America’s defeat in Vietnam.